What? A ride, but it’s not Tuesday? Â Well, it’s not a huge ride, so don’t get too excited. 🙂 Â My STN buddy Andrew agreed to do some wrenching on the Ninjette, so I rode over to his house on the coast today with Peter and Kira in tow in the car. Why have Andrew do the wrenching? Â As I learned the last time I worked on the bike, it’s just not the best use of my time these days. Â I only have one “day off” per week, and it’s not usually enough to get all the work done, which means it drags on forever and I get frustrated and grumpy and say things like, “christ, this is so not the best use of my time”. Â So….off to Andrew’s it goes. The ride over was horrible. Â The scenery is terrible. Â No one should ever ride here. 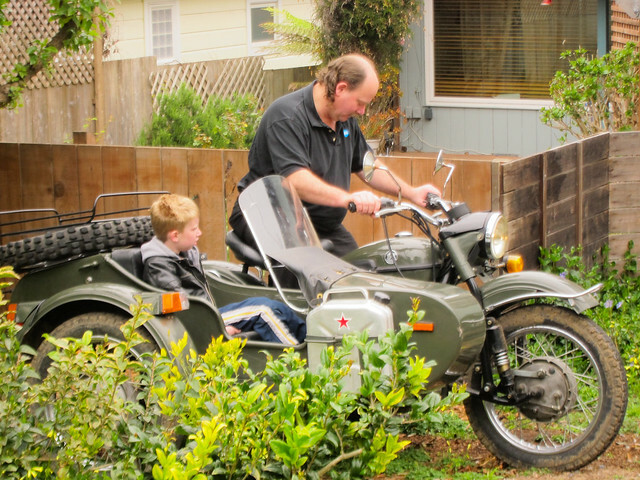 When I arrived at Andrew’s, he was in his front yard with his son Frank and the sidecar. I want a sidecar. Â There is absolutely no earthly reason why I should have one. Â They are huge and cumbersome and a pain to ride and they don’t lean and I have too many vehicles that I don’t ride enough as it is and I WANT ONE. Â They are just so cool looking. Â Plus, orange! Â They come in orange! Bah, this is not a battle that I’m going to win anytime soon. Â But if the magic Garage Fairy showed up and cleaned out space and a sidecar were to magically appear…I wouldn’t complain, is all I’m saying. 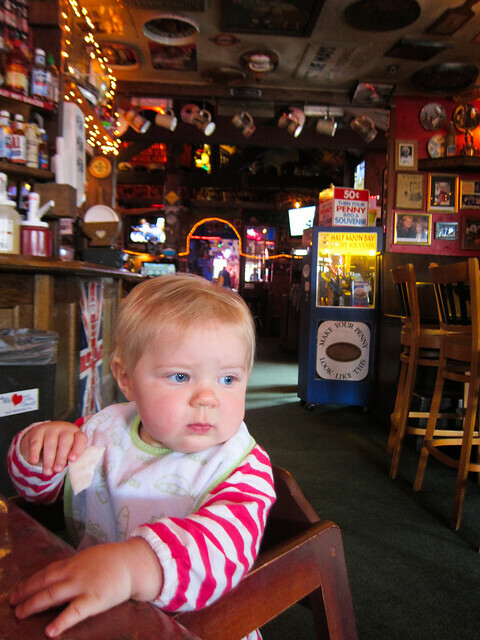 After leaving Andrew’s, we drove down to Half Moon Bay, where Kira had her first meal at Cameron’s. Â Yum yum coastside pub food! So, no rides for a little while until the Ninjette is back. Â Luckily I timed it well and it looks like it might rain for the next couple of Tuesdays anyway, so I don’t think you’re going to have missed anything. This entry was posted in Kira, Ninja 250, Rides. Bookmark the permalink. Kira is a natural in the sidecar! I can totally visualize her with helmet alongside you! 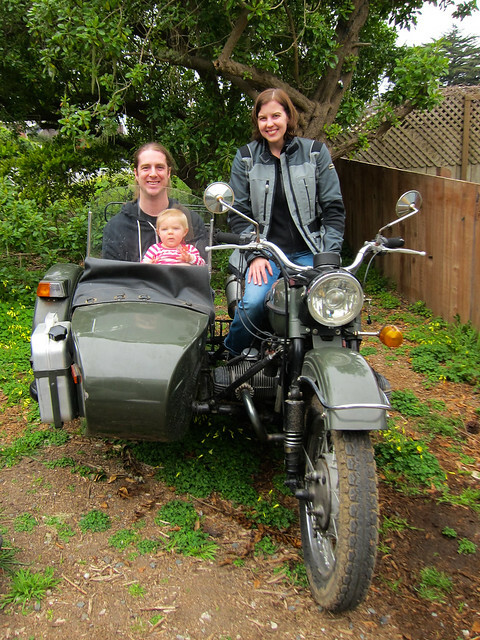 Actually, Peter looks pretty darned good in a side car…as a kiddie seat! 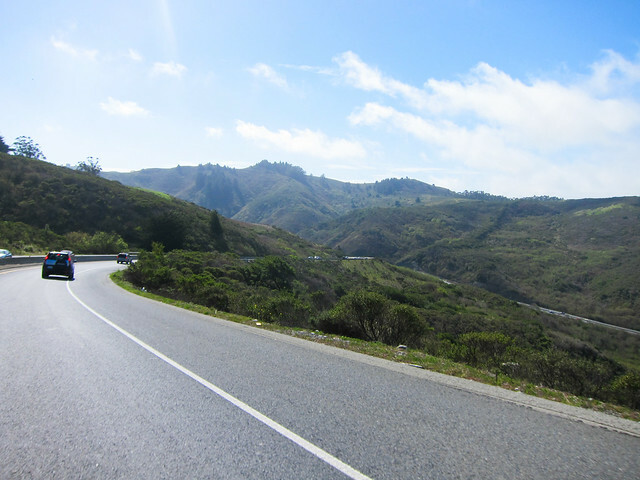 And you’re right…LOUSY scenery!!! Different Kim, you could drop that SV650 off here in Yankton, SD and then (if it thaws) I would be happy to treat it to the Black Hills and the Badlands.